You can track your daily workouts and share fitness information with your friends by using the Endomondo app for iPhone and Android phones. This fitness app even allows you to set up challenges making working out both fun and competitive. For those into working out, whether it is biking, walking, running, skating or anything else you enjoy, the Endomondo app can make your workout more exciting and fun. The basic app can be downloaded to your smartphone or Garmin watch for free. Endomondo can connect you to a large network of sports enthusiasts, making it possible to support and challenge others with the same interests. Endomondo is a great app for tracking your fitness activities. For those looking for social support and a way to monitor your progress, this app is ideal. Downloading the app is fast and easy to do. The free app has many cool features but to really enjoy all that Endomondo has to offer, you'll need to download the Pro version, which costs about $5. For those who are looking to create a workout online then download it your phone, be aware that this is not possible with the free app. This app is straightforward and easy to use. It is a fun and useful addition to any mobile device. For those who are looking for a bit more, consider an upgrade to the PRO version. To download the app, visit Endomondo's download page to see a list of supported devices. 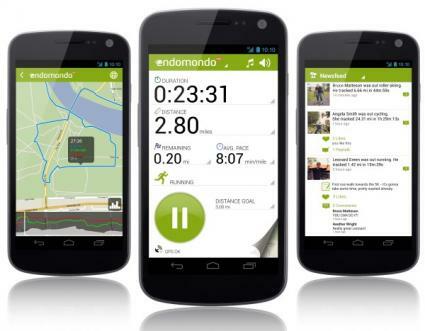 Endomondo can be downloaded free for iPhone at iTunes and for Android on Google Play. To find out more, visit Endomondo.com.